Initially, the Hebron Church was operating from a small hall. Right from that time, Pastor Edison had a burning desire to build a state of the art church complete with the latest technological amenities and facilities. He prayed and God gave him a blueprint on the structure of the new Church in the year 1995. The building structure plan was quite ahead of the times. 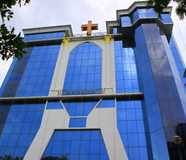 In the year 1997, while looking for a suitable land to build the future church, Pastor Edison saw a fitting place in Lake Area, 7th Cross Street at Nungambakkam. He approached the owner of this land who was a Christian, but a rigid person who was known to be non-negotiable in reducing the price. Hence, the deal did not fructify at that time. Then Pastor Edison and his wife decided to wait for God to show them a concrete place to build the church. The Pastor's family made a decision. 21 days they fasted and on each day they went around the Chennai city seven times, praying God to show them a place for building a church. Totally they went around Chennai city 150 times. At the end, in the year 2002, they came back to the same location at Lake Area, 7th Cross Street at Nungambakkam. The Holy Spirit put a thought in their hearts asking them to meet the owner and speak to him again. So, Pastor Edison met the owner again. Initially, the owner refused to sell the property to him. But when the Pastor told that God had concretely shown that His church will certainly be built there, the owner finally relented and the place for the new Hebron Church was born. The Lord was abundantly graceful to meet the budget needed during the second phase of the construction. At every stage, there were hurdles to meet the required amount of money. In addition, lot of other obstacles tried to stall the main sanctuary construction work. Still, God was faithful to the Pastor till the end and met every need and solved every issue at the right time towards the construction work. Finally, the destined work was completed. The Temple of God rose majestically in Chennai. The divine and ancient decision of the Lord God brought to life the Hebron Castle Church. On December 16, 2014 the Main Sanctuary was inaugurated by the Grace of God. Today, when people see this Church, they are surprised by the way it was built. The book "Power of Tears" describes the chronicles of Hebron Castle Church. The Hebron Castle Church stands as a testimony to the Grace and Mighty Power of the Lord.